Most parents buy their children toys in hopes of helping them develop dexterity, longer attention spans, and beneath it all, in hopes of keeping the children occupied long enough that parents can finally take a shower or brush their teeth or do any number of routine tasks that seemed like no-brainers before parenthood. Frustration ensues when your kid plays with a carefully-selected new toy for approximately 2 milliseconds before dumping it in favor of something else, or, worse, in order to gawk at an empty toilet paper roll for a while. And truth be known, while I pretend to complain whenever my kids dump fancy electronics in favor of cardboard garbage, nothing makes me happier. It means they are flexing their creative muscles, pouring imaginative juices into inanimate objects instead of passively being spoon-fed entertainment cooked up by adults. I think Legos, however, may be the perfect intersection between modern innovation and childhood creativity: able to stack and cling, but lifeless without a hefty dose of imagination. I suppose you could just make whatever designs you see on the box (still building skills along the way) and I knew a kid who did just that growing up. He was the kind of kid who followed numbered steps to build whatever models were laid out in the instruction manuals before superglueing them down tight and yelling at anyone who messed with them. He also used to use Cheetos bags to eat Cheetos (bending the bag over his fingertips) so he wouldn’t get Cheeto residue on his fingers (that kid must’ve been potty-trained at gunpoint). He grew up just as uptight as he’d always been, hoarding limited-edition Mellow Yellow sodas until they tasted like battery acid. 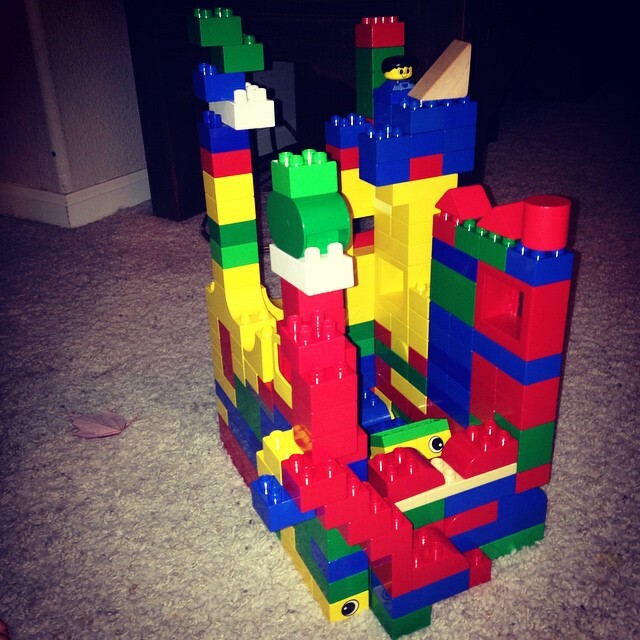 But most kids let the colorful blocks stack out whatever wild designs float in their heads before breaking them down and stacking them again, ad infinitum. No need to teach them Zen lessons about impermanence; the notion comes naturally to most little ones. And I’ve discovered that kids love Legos so much, they are apparently a large measure of wealth in Toddler World. The other day, I overheard my three-year-old boasting with another girl at the local library about the awesome collections they have at home. Brontë: I have SO many Legos. They get all over. Other girl: I have lots of Legos too. Brontë: I have TWO BIG BOXES of Legos. Other girl: Do you have Princess Leia Legos? Because I have Princess Leia Legos. Brontë (intimidated): Well… no. But I have Cinderella and Ariel and Snow White and Dr. Stuffins Legos. Other girl (eyes bugging out): Doctor Stuffins!? Hmm, looks like Brontë won that round. Dr. McStuffins must be the Ben Franklin of Lego toddler currency. Oh no! Not Legos! I’ve tried not to give much unsolicited parenting advice over the years, but DONT BUY LEGOS is the one piece of advice I give freely. In your case it’s too late. My reason for this advice is simple: No matter how compulsive you are, one day your child will leave just one Lego block out and you will step on it in your bare feet at night. Worst pain ever. Haha, I can see your point. Not only will you step on them, but they leak into every crevice of your house. If you shake any object over here, I guarantee that a couple Legos will drop out. But I’m willing to pay a steep price for anything that keeps my kids occupied for more than five minutes. NextThe Basket Monster Strikes Again!